Cataracts are common particularly among people over the age of 50. When the lens of your eye becomes cloudy it is called a cataract. Symptoms include decreased vision without pain, increased glare in sunlight or at night, and/or a sensation of having a film over the eyes. Mild cataracts might require no more than new prescription lenses, but if your vision is impaired to the extent you no longer see normally, and when you cannot see well doing things such as driving or reading, consider surgery. Cataract surgery can free you from being dependent on your glasses. It is common that after cataract surgery patients no longer need glasses. night vision, and difficulty reading, sewing and crafting. Dr. Kozlow is an experienced eye surgeon having performed over 10,000 eye surgeries. He is pleased to provide the latest techniques in cataract evaluation and surgery. 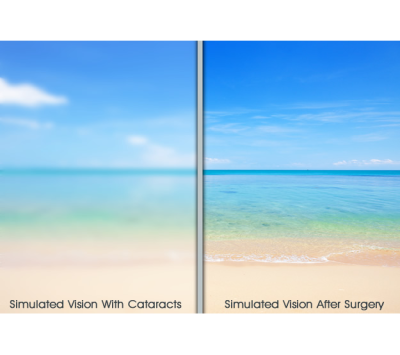 Cataract surgery is a safe, painless procedure that corrects cloudy vision. Done in an outpatient surgery center, the cataract is removed through a tiny incision that does not require stitches and replaced with an intraocular lens (IOL) which focuses the light on the back of the eye. When you arrive at our surgical center our Anesthesiologist will provide you with intravenous sedation to ensure you are relaxed, comfortable and safe during the procedure. Postoperative eyedrops are used to reduce inflammation and prevent infection. Dr Kozlow is now offering dropless cataract surgery. Most patients return to normal activities the day following the procedure. There are a number of different intraocular lens (IOL) options available to patients. Standard IOL’s are fully covered by insurance, but do not correct astigmatism or presbyopia (the inability to see close after age 50), so reading glasses may still be required after surgery. Toric IOL's correct astigmatic vision, but is not fully covered by insurance. Multifocal implants correct presbyopia, allowing a more full range of vision from distance to near, reducing dependency on reading glasses postoperatively. While the non-standard IOL's do require the patient to pay a part out of pocket, the many options for specialized IOL's available today can significantly improve eyesight and lifestyle, and can be tailored to fit the patient's individual needs. Dr. Kozlow will discuss these options with you before your surgery to give you the best possible visual result based on your specific needs and desires.